Business Conferencing system from Grandstream. The Revolutionary, feature rich Audio & Video Conference system break the barrier of your conferencing needs.Crispy video and HD audio support give you real-life experience in your business conferencing.Multiple protocol and platform support give you ease in communication with your business clients around the world regardless of their platform.The Grandstream Video Conferencing Systems supports H.323/SIP dual protocol as well as any conferencing application available in Google Play store including Skype for Business, Bluejeans, Zoom, Lifesize, and Hangout. 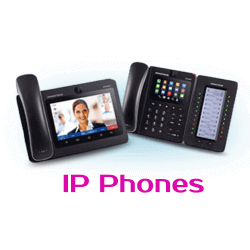 Most importantly Grandstream Video Conference System allows you to mix calls from users on different platforms[ can bridge calls from Android apps into SIP conference]. 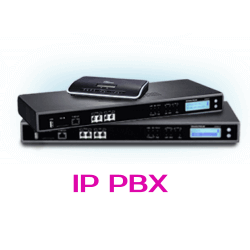 The H323 Protocol support helps you communicate with Polycom Video Conferencing, Cisco Video Conferencing, Huawei Video Conferencing, Lifesize Video Conferencing and Avaya Video Conferencing. The SIP-based GVC3200 Series supports Grandstream’s robust IPVideoTalk platform for plug and play video conferencing while also being interoperable with any 3rd party SIP video conferencing platform. 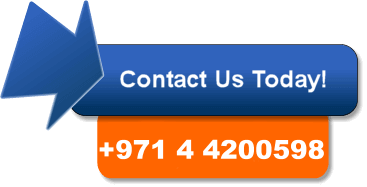 Grandstream Video Conferencing systems offered with different models to suit every business conferencing needs. 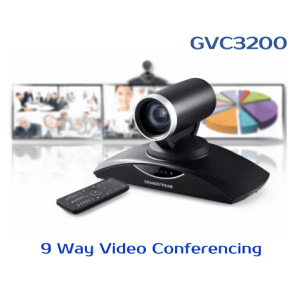 The GVC3200 offer 9 Party conferencing with 3 Display support and 12X Zoom PTZ Camera. In comparison to GVC3200 VC System, the GVC3202 and GVC3210 offer a slightly lower capacity option for businesses looking for up to 3-way video-conferencing and support for up to 2 Full HD monitors.The GVC3202 having 9X Zoom PTZ Camera and GVC3210 offer 16MP, 90 Degree wide angle Static camera. All the models of Grandstream Video Conferencing System offer HD Video and inbuilt VGA/HDMI Ports for Content Sharing.The New GVC3210 Model support 4K and HEVC/H265 Codec support. Grandsream Video Conferencing systems are designed with a High level of User-friendly operation.Video Conferencing operations can be controlled with GAC2500 Conference Phone Touchscreen interface. Additionally, the VC Systems are equipped with Bluetooth remote control with multi-touch touchpad.Grandstream VC System help you Easily record all video conferences to document meetings.The GVC3200 series VC Systems can remind attendees 10mn before start-time and automatically call all the participants. The Grandstream GVC3202 is a ground breaking video conferencing system from Grandstream.GVC3202 offer businesses a revolutionary video conferencing experience with great flexibility threw the support of any sip platform and all android Apps.It has inbuilt robust IPVideotalk platform support for plug and play video conferencing.As it is based on Android you can enjoy the full video conferencing apps in Android store. The GVC3200 is a ground-breaking solution that offers small businesses a revolutionary video conferencing system with unprecedented flexibility and the power of support for multiple popular video conferencing protocols and platforms right out of the box.GVC3200 offers full access to all video conferencing apps in the Google Play Store — such as Skype®, Skype for Business®, Google Hangouts™ and more. Grandstream GVC3210, the latest addition to Grandstream’s GVC series of video conferencing solutions, is an ideal choice for businesses looking for a high-quality yet price-friendly solution for their small-to-medium sized conference rooms.The GVC3210 powerful yet easy-to-use video conferencing device works with many third-party SIP-based platforms, including Broadsoft and Asterisk, and runs on the Android operating system. Grandstream GAC2500 is an Android-based Business Conference Phone that will redefine the choices, flexibility and mobility available in any workplace. 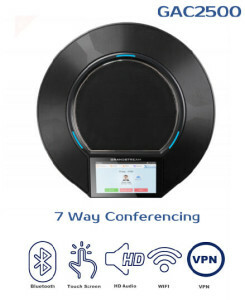 It supports up to 6 lines and 6 SIP accounts while also offering full access to the Google Play Store in order to hold conferences through Skype, Google Hangouts and more.With built-in Bluetooth, WiFi, 7-way conference bridge, It also offer tremendous mobility and flexibility.